Most likely, at home, you would have atleast 5 chargers always plugged in, waiting to be connected to respective devices every night. When you are travelling, this poses a problem of serious inconvenience too. Not to mention the clumsy wires all around. Only a few aiports have charging kiosks. So, wherever you go, you must carry them all along. Not so convenient. But Is there a viable alternative in the market? Well, a Yes and a No. Precisely, not YET. If we can wirelessly transmit power to these devices, we can get rid of the hassle of chargers. Learned that There was lot of research going on to transmit power wirelessly. 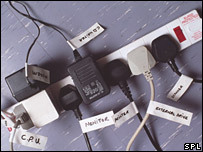 Not to powerup your cellphones and other devices, but to power up areas which can not be wired up. Same concept could be however used to charge your devices. [Wiki]: The development of wireless energy transfer began in earnest with the lectures and patents of the electrical engineer Nikola Tesla. In experiments around 1899, Tesla was able to light gas discharge lamps (similar to neon signs) from over 25 miles away without using wires. But it appears that there was not much development later on to put the experiments and concepts to any considerable practical use, despite minor applications. Conceptually there are three methods known to transfer energy wirelessly. Wireless energy transmission could be part of a clean, abundant energy future says The Millennium Project of the American Council for the United Nations University. To meet the world's growing appetite for energy without environmental damage, electricity would be converted to microwaves, beamed over long distances by satellite, and then reconverted back to electricity. As per an article , NASA has tested this technology, and The Millenium Project has decided to use this technology to trasmit power. But no indication or research that I am aware of about how this can be used to charge mobile devices. If you have seen an Electric tooth brushe, you have already seen this concept in use. [Wiki]The electronic compartments in the electronic toothbrushes are completely sealed to prevent water damage. There are no metal contacts. These toothbrushes charge using a technique called inductive charging. In the brush unit is one half of a transformer, and in the charge-unit is the other part of the transformer. When brought together, a varying magnetic field in one coil induces a current in the other coil, thereby allowing for the charging of a battery. A UK Company called Splash Power has came up with a solution using this technology to charge your devices wirelessly. The solution requires a special element to be inserted into your mobile device. This spalsh enabled device, then can be placed on a Charging pad (SplashPad) to charge. They have reportedly demonstrated with NTT DoCoMo's FOMA 3G phones and the Apple iPod at CEATEC consumer electronics show in Tokyo, Japan from 4-8 October, 2005. Not sure when all mobile devices will be equipped with Splash module in the general market. But looks very promising. A BBC News Report says MIT researchers have outlined a relatively simple system that could deliver power to devices such as laptop computers or MP3 players without wires. The idea is based on Resonance. When you have two resonant objects of the same frequency, energy can be transferred between them. "If you bring another resonant object with the same frequency close enough to these tails then it turns out that the energy can tunnel from one object to another," said Professor Soljacic. A simple copper antenna designed to have long-lived resonance could transfer energy to a laptop with its own antenna resonating at the same frequency. The computer would be truly wireless. However, the team has not built and tested a system, computer models and mathematics suggest it will work. Read more at BBC News Report & MIT News. So wait is not over YET, but there is a promise that one day, we can charge our cellphones without every having to connect to a charger, I mean wirelessly.